US Taiwan Defense Command: USTDC Compound Photo! This is the photo that I mentioned yesterday that shows the entire US Taiwan Defense Command compound. It was probably taken sometime during the late 1950s. If you look toward the center of the photo, you'll see the corrugated steel canopy the was over the main entrance, or quarterdeck, of the building. 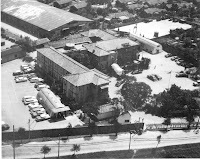 The quonset hut to the left of the building was the photo lab where Sarj Bloom, who provided this photo, worked as a PH2. I only see one flagpole at this end of the front parking lot. When I was there during 1973-1974, there was a second flagpole several yards to the right (from this angle) where the US flag was raised each day, as the ROC flag was being raised on this one. To the right of that front parking lot was a structure -- either a barracks or maybe a day room -- for the ROC soldiers. You could hear them playing ping-pong over there during the day. There are two quonset huts shown here, one on each side of the main building. Neither quonset hut was there by the time I arrived, and I don't remember any of the buildings behind TDC. Of course it has been thirty-four years, so the fact that I don't remember them doesn't necessarily mean that they weren't there. Anyway, Sarj Bloom has shared a real gem of a photo here that will undoubtedly bring back a lot of memories. I'm sure you all appreciate it as much as I do. Looking at these photos and the apparent Japaneseness of the building plus it's unusual shape. I'm begining to think that is the USTDC building on the 1944 map. Thank you. After looking at the 1944 map and the location, and given the architectural style, I also believe that this building was originally built in the 20's or 30's by the Japanese, but probably for some other function. It was then probably expanded for the USTDC usage when the warehouses went up in the 1950's. The link to the Taihoku map you posted was very helpful. I can also see why the area around the railroad station and yards may have been bombed, but all of the photos I have of heavy bombings took place near factories in and around Kaoshiung which housed the Japanese fleet.